Yes just checked potassium, its 400ppm salifert test kit. So its fine. So will start dosing AAC 4 drops & CV 8 drops weekly twice. From the two pictures I can not see anything negative about this coral, I would say the green coloration it had before is not the “natural” coloration of it. If it does still show good growth and polyp expansion I would not worry much about it at the moment. Yes polyp expansion on corals is good. 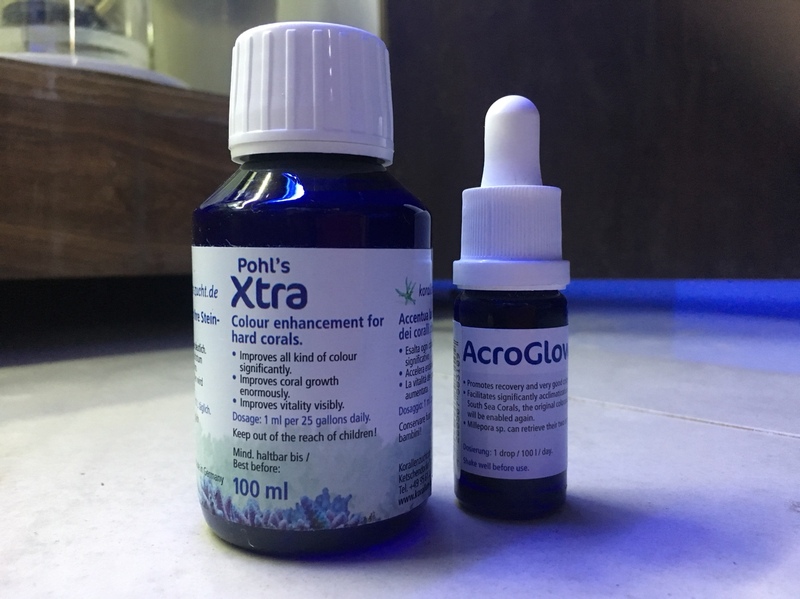 Any suggestions on pohls xtra & acro glow? Lfs has a great deal on the bottles. So pohls extra 4ml & acroglow 4 drops x weekly twice? Please post a update of the actual PO4 and NO3 level. Have both already started to decrease slowly ? Phosphates still not come down and nitrates was zero which has increase 0.5 . If the coral is healthy, switch the reactor to a continuous flow of approximately 370 liters per hour. At the same time, vacuum the sand and change the water for a period of time to remove the sediment from the deep sand layer and adjust your skimmer to make it moister every day or every other day. The tank is about a month old and needs a little patience. It's hard to say that it varies with the environment. carbon daily to keep the surface clean. Yes jacky the system is barely a month old now. I ll change the zeolites on 1st week of Nov. and after 10 days of 3hrs on/off and i change it to run 24x7. I will do waterchange on sunday and vacuum the sand bed also. Skimmer is also running wet. There are no signs of cyano now. But i can definitely say the corals colors have lighten. The pink birdsnest i have was also dark reddish color and its now pink lightened for sure. pay attention to the K+ level. Potassium is in good 400ppm. Had checked 2 days ago. I ll keep monitoring weekly. @Alkane dropped to 7 dkh. I think I will take it to 7.5 dkh. The potassium content is low because you say 350ppm. It will slowly increase it to 400 in a few weeks. Let them be at the level of data you maintain and be stable. Weekly monitoring I think too little, 3 days, continue this action. You can learn more about tanks for a long time, like my tank needs 4~5ml potassium added every day. 380~390 occasionally to 395 or 400. Do you have a chance to cross check your PO4 test result with a high sensitive test or a photometer ? With a PO4 level of 0.25 mg your corals should look different. From the last pictures I expect the PO4 level is much lower.